The finale of the fourth season of Game of Thrones changes the fortunes of the series’ characters. Salvation comes from the most unexpected of sources and often turns entire stories around. By this season’s end, our characters are more far flung than they have ever been and not just geographically speaking either; there is cautious optimism at the Wall following the episode’s opening which contrasts rather starkly with the utter despondence Tyrion finds himself filled with. Compared to previous season finales, this one doesn’t jump around as much – a small handful of storylines get their conclusion and everything else is a more minor update to remind the audience of how matters currently stand. In the past, Martin has spoken of the butterfly effect that the show’s changes have on the story being told in the adaptation. With season 5 on the horizon, this final ‘historical’ write-up will focus on where the show will go in the upcoming season, while also commenting on the character’s various arcs and how effective they were now that they’ve been completed. The episode opens with Jon Snow, continuing where last week’s showcase left off. 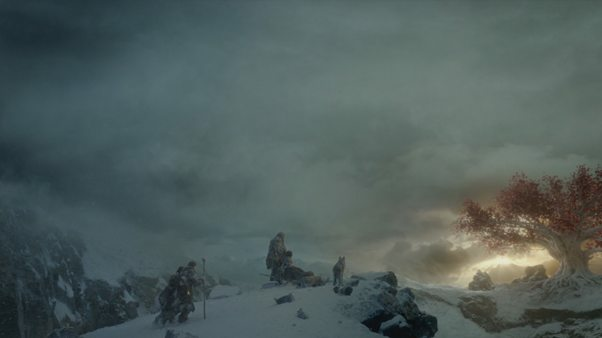 Jon’s story this season felt like it spent a lot of time building up towards the Wildling invasion but the invasion itself feels a little underwhelming given that the big war that the season has been leading up to ended after a single night’s fighting. The show did a good job of milking that one night for all it’s worth, but at the end of the day (night? ), the magnitude of the Wildling invasion does feel very much diminished. Jon’s scene with Mance was excellent though – it was chockfull of tension but not hostility. Jon respects Mance and it would seem, despite everything that transpired, vice versa which leaves the door open for any future cooperation between the two of them next season. Now, Davos’ presence at the Wall could mean a whole bunch of things – it could mean that Rickon is finally getting the cut for good or it could just mean that Davos will be officially departing Stannis’ side at the beginning of next season. Likewise, Mel’s insistence that Shireen be present at the Wall would indicate that she is necessary for whatever Mel has in mind and it’ll be interesting to see that play out. It would have been a little much for Jon to become Lord Commander in this season itself but that could be a strong opening scene for the storyline next season. 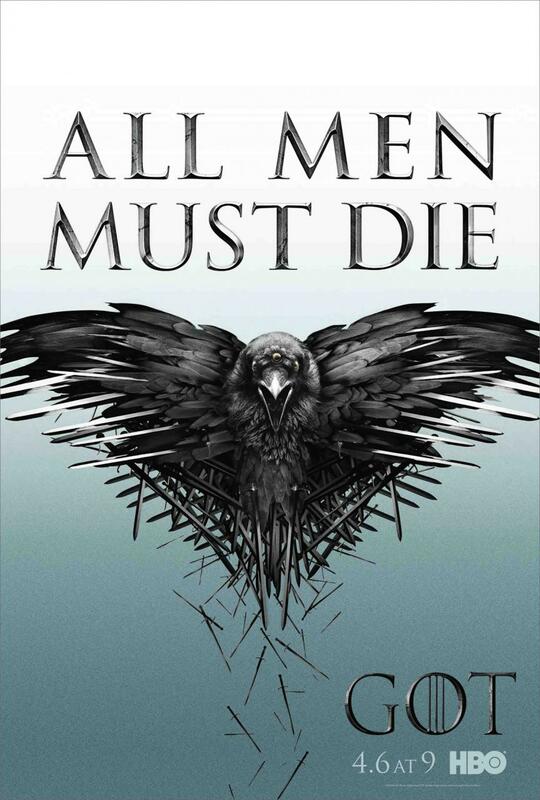 The story at the Wall ends with some teasing of the new character dynamics – Stannis and Jon, Jon and Melisandre along with a good helping of Tormund and Mance tossed in for good measure. Further north though, things got weird. The three eyed raven has been a big, recurring part of Bran’s story but its conclusion felt inexcusably alien. There were a whole host of issues here. The difficulty in adapting Bran’s storyline has always been that it is really slow and slow-pacing translates particularly poorly to television. The logic behind this episode’s scene in particular, is clear – Bran’s story is finally building up to this big reveal and we need some bells and whistles to mark the occasion, so let’s toss in some action, with some magic and fantasy creatures to seal the deal. Leaving aside the fact that the CGI wasn’t particularly good (apparently, it all went into chaining the dragons), the whole scene was just confused and rushed. Not only do we don’t get a chance to really say farewell to Jojen but it is also not really clear what those creatures guarding the cave were because they sure as hell weren’t human. Does this imply that the White Walkers can conjure up beings other than wights? Or were those supposed to be wights but just not particularly well rendered? Either way, the scene marked another interesting deviation from the source material; the Jojen’s possible death has been discussed all too thoroughly in the fandom (look up Jojen paste) but the age old question of the show’s canonicity arises here again – does Jojen’s death here imply that he dies in the books as well? As we move firmly away from published, existing material, this is an important question to answer. The highlight of the episode of course, was the lion’s death. 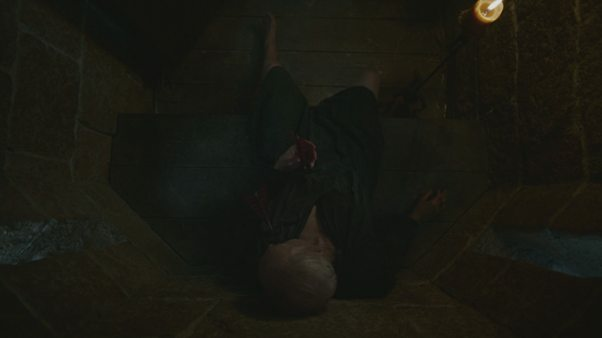 In its mot literal sense, it was Tyrion of course, who dealt the killing blow (or shot the killing blot, if you would) but the Tywin Lannister’s downfall did not begin with him. Leaving aside, of course, the bigger question of whether or not Tywin’s actions benefited House Lannister, it was Cersei who hammered the first nail into her father’s coffin. Lena Headey has always been one of the show’s better performers – while she has been slightly overshadowed by her co-stars at times, her performances have never been anything less than entertaining and have often been excellent. Watching Cersei throw a mountain of spite in her father’s direction was riveting scene to watch and not just because there was an air of incredulity that Cersei would actually be so bold as to hold her own confession to ransom, but also because of the silent venom in Headey’s voice as she delivered those lines; it certainly made Tywin’s ill-fated midnight bowel movement believable. Tyrion’s part in his father’s death, however, is a lot more problematic. It is tempting to think that Shae going at Tyrion with her knife and him killing her in self-defence is HBO white-washing it’s more profitable show and said show’s most popular character. It is even easier to call it cowardice and a blatant dilution of the character’s darker moments. It is all of those, in truth, and perhaps more, but it is also understandable. When seen through Tyrion’s eyes, Shae’s death is justice, an almost karmic punishment to the lying whore who lied so colourfully about the man who loved her and tried so hard to make her happy. Seen through more objective lens, it is murder; pure and simple. HBO isn’t known for shying away from dark moments but Martin’s characters are almost too complex for the show’s format to do full justice to. 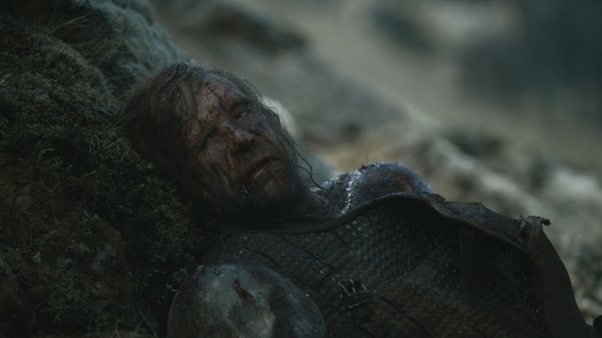 How long did it take for Sandor Clegane’s sympathetic backstory to emerge on the show? 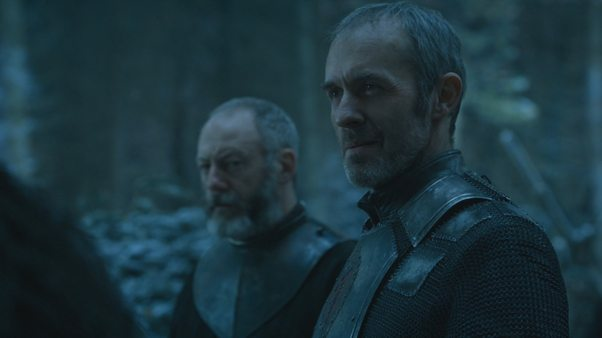 How long did it take for Stannis’ good side to finally show (at this point, I’ll take what I can get)? While I hate the change and fully agree with the vitriol against it, I have to admit that I do understand the logic behind it. Lastly, Brienne, Arya and the Hound all meet up but despite their numerous mutual acquaintances, or perhaps because of them, tension runs high and the Hound ends up dead. Fans of the Cleganebowl (get hype!) will find nothing here that will either affirm their faith or make them question it; Sandor is decidedly alive when Arya leaves him but he is also demonstrably near death. Arya comes off as a little colder than necessary, especially in light of issues with white-washing characters’ morality, given how long Sandor has kept her safe. The Hound is not a pleasant man and it seems unlikely that he ever will be but perhaps he deserved better than a slow, miserable death screaming for mercy. The fight scene that led to his death was well-choreographed, better in fact, than the fight between the Mountain and the Viper. The camera work was smoother, and having both actors perform their own stunts made a world of difference. What made the final scene odd though, was the positivity to it. Arya was leaving her homeland, the lands where her family lived and died, to go to a new city where she doesn’t know the language, the people or the culture. To some, that’s exciting and perhaps very believable but to me, it feels strange that something that could be so incredibly dangerous, if not downright bleak, would have such a positive tone attached to it. The heavenly choir and the gorgeous cinematography both gave the impression that Arya had ‘made it’, that had achieved something in reaching the point where she was. It didn’t seem that the story needed that, but rather that the scene itself made for a stronger ending than any of the other options director Alex Graves had in mind. There were a bunch of other smaller scenes like Jon’s final farewell to Ygritte, Dany chaining her dragons or Cersei commissioning the creation of an abomination, but there isn’t a whole lot to talk about there. On the whole, it felt like Season 4 had stronger individual episodes but weaker overall structure than previous seasons. Without a ‘side’ to root for anymore, it feels like audiences have disengaged a little from the series’ central conflict and it might take some time to get them reinvested in the bigger battle between Ice and Fire. It will be interesting to see how Season 5 handles this issue. With that, we have reached the end of season 4 of Game of Thrones. I would like to thank everyone for reading and commenting! I say this often enough as it is, but another time wouldn’t hurt; I am truly, deeply grateful for anyone who reads these little write-ups I do. Each comment, like or follow on WordPress, gives me a truly pathetic little morale boost for which I’m equally pathetically grateful.